During the night of 13 April 1940 there was a heavy pounding on the door. It was the Soviet Secret Police (NKVD) demanding that Eugenia Huntingdon and the other members of the household pack their possessions and get ready to leave. They were being deported from Stanislavov in eastern Poland to the Soviet Republic of Kazakhstan. Eugenia and her son, together with the Soborskis family they were staying with, were loaded on to trucks and driven out of town. They stopped beside a railway line and were ordered to get on board a very long train of cattle trucks. The trucks were filthy, smelly and dark. It was freezing cold as they travelled from southern Poland, where spring had just arrived, into Russia, where snow lay thick on the ground. They were occasionally given hot water for tea and loaves of heavy dark bread. After 18 days of travelling, on 1 May 1940, their journey came to an end. They had arrived in northern Kazakhstan. In September 1939 Poland was attacked and occupied by both Nazi Germany and the Soviet Union. They divided Poland between them. Germany occupied western Poland and the Soviet Union the east. 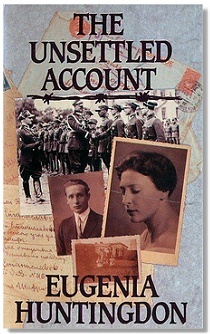 Eugenia Huntingdon and her son were evicted from their home in Stanislavov by the NKVD who requisitioned their building for their headquarters. They were allowed to take only what was necessary for their immediate use. They eventually came to live with a family called Soborskis. Eugenia's husband, Henryk Duszynski, had only recently been appointed as Deputy Head of the Department of Justice at the War Ministry in Warsaw. In August 1939 he received orders to report for military duty. After the Soviet occupation Eugenia waited anxiously for news of his whereabouts. In February 1940 she received a letter from him. It was postmarked in Russia. He was being held in a Soviet prisoner of war camp at Kozelsk, near Smolensk. She received two more letters from him, one in March and another at the beginning of April. In April 1943 she learned that the Germans had found the mass grave of Polish officers in the Katyn forest. Thousands of Polish officers had been shot by the Soviet Union. Eugenia's husband was one of those victims. Eugenia, her son and the Soborskis family, were taken by truck, after their arrival in Kazakhstan, to a small village called Novo-Troitsk. This was to be their place of exile. It was only a short distance from the Siberian border. North Kazakhstan has a harsh climate of hot and dusty summers with very cold and snowy winters. They were left to find accommodation where they could. They were offered a small uninhabited hut on the edge of the village. In the first fifteen days in Novo-Troitsk we had learned quite a lot. We had sold for roubles or traded for food some of our possessions and now had a supply of flour and potatoes...The nearest water well was more than a quarter of a mile away and the road leading to it was slippery and muddy...very soon the mosquitoes and other flying insects made their appearance...they came in millions and tormented us day and night...Even smoke did not deter the pests. Kazakhstan was a cruel and uncharitable country. On 22 June 1941 Nazi Germany attacked the Soviet Union. In the middle of August 1941 Eugenia was asked to report to the local NKVD. She was astonished to be told that all Polish deportees were now free and that she and the others could leave at anytime. Their freedom was the result of an agreement between the Soviet government and the Polish government-in-exile in London signed on the 30 July 1941. The reaction of the Polish deportees in Eugenia's village was mixed. Some were afraid or didn't have the energy or enterprise to attempt to escape from the Soviet Union. Eugenia heard that trains with Polish prisoners of war, released from concentration camps, were passing through the railway station of Magnai, 10 miles from her village. She managed to board a passenger train and talk to the Polish prisoners of war. She was shattered by what she saw. Eugenia left the train and returned to her village. She immediately made plans to leave. At the end of September 1941 Eugenia, her son, and the Soborskis family went to Magnai station. They were able to stay in a hut at the station until eventually they were allowed on a train on the 26 October 1941. It was about 100 km (60 miles) to Buzuluk. The train was packed, it stank and people were sick. They arrived at Buzuluk to be greeted by the wonderful sight of men in the uniform of the Polish Army. They spent the winter at Buzuluk in temperatures well below freezing. Many did not survive. Eugenia and her son eventually left Buzuluk heading by train for Persia. They arrived at the Russian port of Krasnovodsk on the Caspian sea and boarded a packed boat of Polish refugees sailing across the Caspian sea to the Persian port of Pahlevi. From there they reached Teheran in April 1942. Eugenia later went to India and her son to Palestine. They both made their way to England in 1948 where they settled. Publisher - Published in the UK in 1986 and in the USA in 1988 by Severn House Publishers. This page was added on 27 September 2009.